Making art is my compass, guiding me through the challenges of living in an aging body, in a chaotic world threatened by climate change, injustice and despotic rulers. My work is often a visual expression of a sensory experience- the smell of smoke, the heart-pounding fascination of watching a fire on the next ridge, the weight of hopelessness. In my twenties the creative force that had been squashed at an early age by a shaming teacher was re-ignited, taking me initially into the world of fabric arts and basket-making. Being part of the MendoDada group helped me see that art could be fun, irreverent and political. In the early part of this century I turned from mixed media to painting, first working in acrylic and then, when I discovered the luminosity and versatility of encaustic, working in that medium. At a certain point I noticed that I just wanted to paint on the surface of my encaustic pieces and returned to painting on canvas, using water soluble oil paints. More recently, I’ve found a happy medium between encaustic and oil painting by incorporating cold wax into my work. 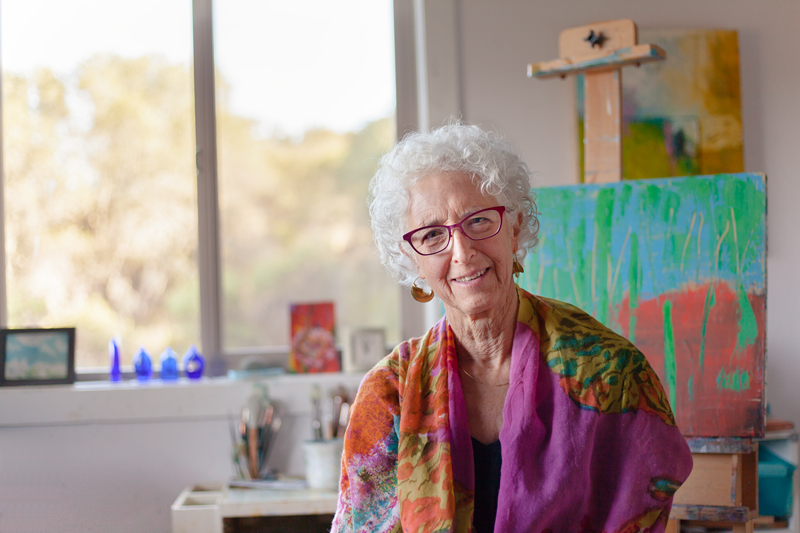 My relationship with art-making is continually informed and inspired by my work as a clinical social worker and psychotherapist, my deep connection to the natural world and the delight of grand parenting two young, creative souls.